There have been promises of an overhaul to Ubuntu's default theme for quite some time. Ubuntu 9.10, set to be released at the end of this month, will begin delivering on those promises. Below, we take a look at the new system theme and artwork that will debut in Karmic Koala. The touch-ups to Ubuntu's default look in Karmic are a bit short of the complete overhaul that Mark Shuttleworth has alluded to since the time of Hardy's release. But they represent much more than the negligible aesthetic changes that have marked other recent releases. 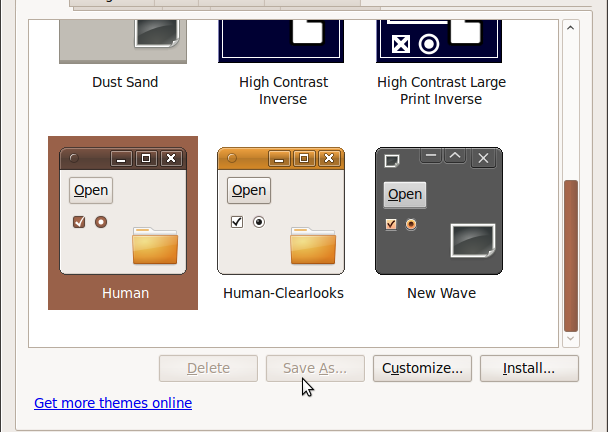 There have been promises of an overhaul to Ubuntu’s default theme for quite some time. Ubuntu 9.10, set to be released at the end of this month, will begin delivering on those promises. Below, we take a look at the new system theme and artwork that will debut in Karmic Koala. The touch-ups to Ubuntu’s default look in Karmic are a bit short of the complete overhaul that Mark Shuttleworth has alluded to since the time of Hardy’s release. But they represent much more than the negligible aesthetic changes that have marked other recent releases. Although the rusty-orange color scheme that Ubuntu users have known and loved (or not) for years remains prevalent in Karmic’s default wallpaper, Ubuntu 9.10’s window-decorator theme features a dark-brown tone. Besides the color change, the window decorations haven’t changed much since previous releases. This is still the “Human” theme, just in a different color. In my opinion, at least, the new icons, which are more detailed and three-dimensional, are a refreshing update to the simplistic artwork that has predominated in previous Ubuntu releases. I am testing the beta on 2 machines at work and notice the boot times are somehow getting slower since alpha 6, hopefully these are just bugs that will get squashed in the RC. I must admit, the eye candy in 9.10 is really coming along though! Probably best to NOT demo the new icons with the TV show you illegally downloaded. Just sayin’. Fritz: good catch. I’m hoping you’re not employed by the RIAA. On the other hand, no one can prove from the picture that I have anything other than a file with a name suggesting it might be an “illegally” downloaded TV show–as far as I know, the liberal state has yet to legislate away my right to name files whatever I want. There’s also no way of knowing whether I’m in a jurisdiction that cares. And I wanted to get an image of the new video icon in, so I thought the risk was worth it. I mentioned it less from a “your risk” standpoint and more from a “there go those Linux hippies with their not respecting copyrights again” standpoint. And no, I’m not The Man. The aesthetics of Ubuntu have never bothered me the way they have some, but from what I see above it really doesn’t look any different. I actually don’t mind though…I find KDE ugly. Gnome has a simplicity that I find appealing. What about the blur tool of gimp for filenames in the last screenshot to prevent unnecessary trouble. If one does not like a theme, colour scheme or set of icons, one can simply change it. So why bother. What I am more concerned with is whether the color of the system try icons can be changed. IMHO this is one problem that keeps the panels from working well at certain colors. I like this shade of brown. I don’t care for the brown scroll bars, that will take a while to get used to. Anyway, looking pretty smart. The icons are nice. It’s getting there folks. I think the icon SVG files should be made with a “base color” that can be changed along with the “Selection” color in the theme, so you can choose any color and the icons will always match the theme. How arrogant Fritz, accusing people without evidence or proof. Ubuntu comes with a folder in your home called “Examples” which can be used to screenshot the different icon types. I personally replace Evolution with Thunderbird, and Empathy with Pidgin. All this windowdressing is nice but are they going to do anything substantive like run my ancient lexmark printer or even run google earth? I don’t mean with all that sudo mumbo jumbo. I want GUI solutions. Looks like every other version of Ubuntu. Unless the performance is mind blowing, I don’t think it’s going to steal much of the spot light this fall. Who cares what it looks like? No one leaves the standard (fugly) theme in place anyway. One of the best parts of ubuntu is you can completely change what it looks like easily. My desktops looks completely different with one clear bar at the top and a cairo-dock on the left. I would like to know more about what is under the hood, rather than what it looks like. I think that matters more to ubuntu users. Are you new? Vista won’t run an ancient printer, why should ubuntu? Also, I have google earth running just fine on my ubuntu machine. I guess some people just don’t get it. I have a question regarding the new home folder icons. I want to create some new folders in my home folder and put icons on them like the default folders (such as the picture icon on the pictures folder, the document icon on the documents folder, etc.). How do I do this? I don’t see anything in the properties. I can manually set an icon from the properties, but doing that assigns a specific icon to that folder that never changes and doesn’t show up on the left panel in nautilus when you drag it there – the default ones are dynamic, they show up on the side panel in nautilus, and if you change themes they change as well. This must be set from a settings file somewhere, but I don’t know where to look for it. In the process of trying to figure this out I tried deleting one of the default folders – the videos folder – to see if the icon would still show up if I created a new videos folder in the home folder. It didn’t, it just created a generic folder with no icon. Now I can’t get it back. Any help would be appreciated. Thanks. Andy: I don’t know of a way to do that besides manually assigning icons to each folder, as you already tried. Someone on ubuntuforums.org might be able to help you, however. I’d recommend asking there. Amazing blog very informative it would be helpful for me..thanks for sharing I’ll recommend your site to my friends and family members great job very appreciated..keep it up..